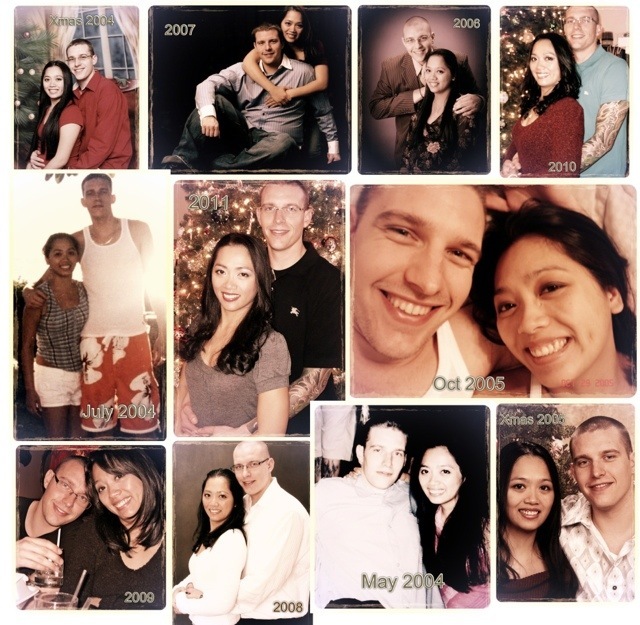 Taking a stroll down memory lane….. The First time I saw him – 6th grade. A friend of mine had a huge crush on him. I was the new girl so I had no clue who he even was but I could tell he was one of those popular and arrogant type of guys. The First time He Looked at me – 6th Grade field trip to the Exploritorium in SF. I was waiting for my friends and his class walked by. He actually looked at me with those gorgeous blue eyes and my heart stopped. The First time he talked to me – 8th grade. Making fun of a project that I did with a friend of his. Our First kiss – 8th grade after school in front of Lone Oak Park. Our First Date – Mission Impossible movie at the Cinedome. Our First Dance – End of the school year dance in 8th grade. He was slightly upset that I got Queen and someone else besides him got King. But since, it’s Sunday – I’ve plugged back in. lol. Yesterday wasn’t too bad of a day. I enjoyed sleeping in. I tried out Kale Chips for the first time. Yum!! And Ben liked them too so I will definitely be making more :-) I also prepped a kale salad using the salad dressing from Karena’s recipe. I would have loved to make the exact one they have on their blog but I didn’t have all the ingredients. I put in what I had and I’m looking forward to having it for dinner tonight. 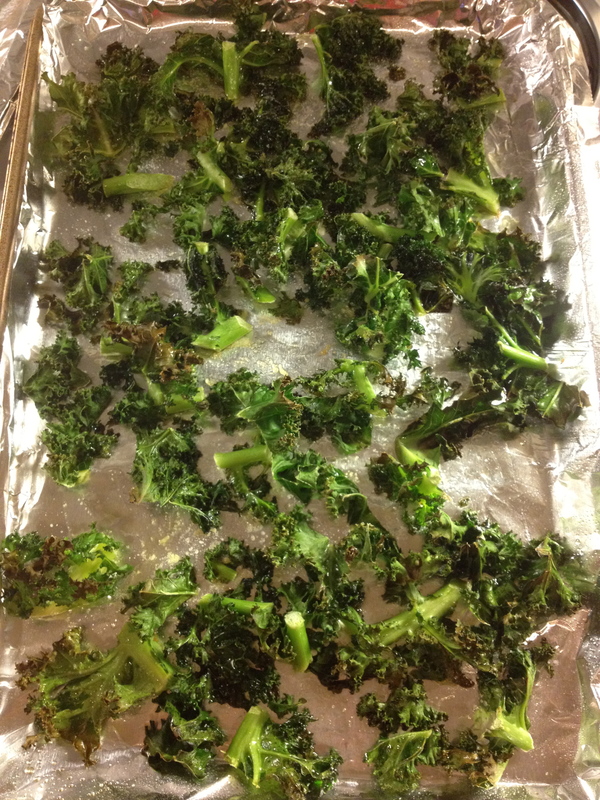 1st Time making Kale Chips - success! 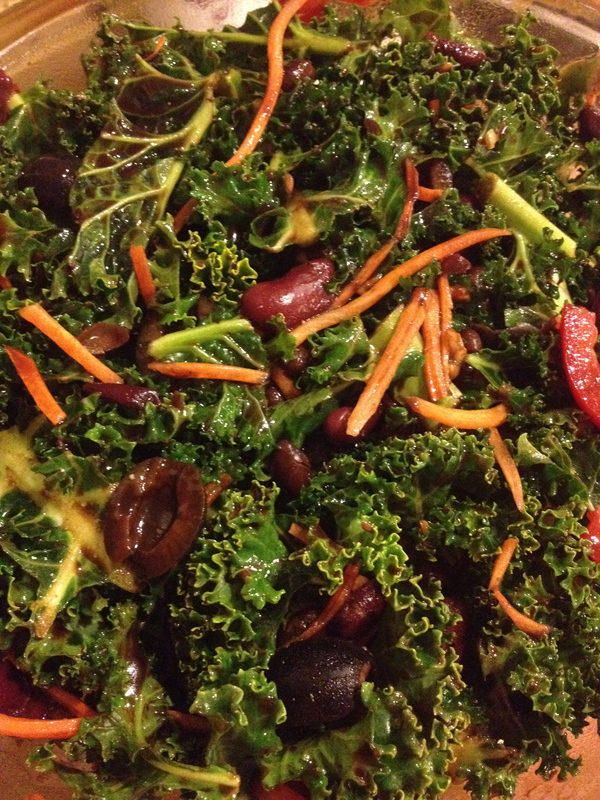 Salad prepped for Sunday dinner: Kale, carrots, tomatoes, kidney beans, and black beans. Mad Abs March Day 24 – 37 pushups!! Yikes! I’m actually sore from it today. 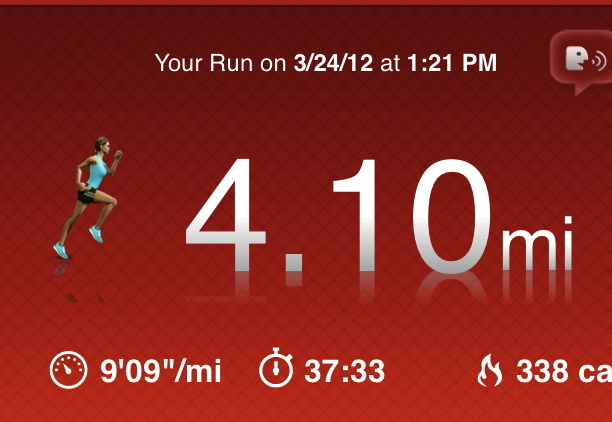 Went for a 4 mile run. 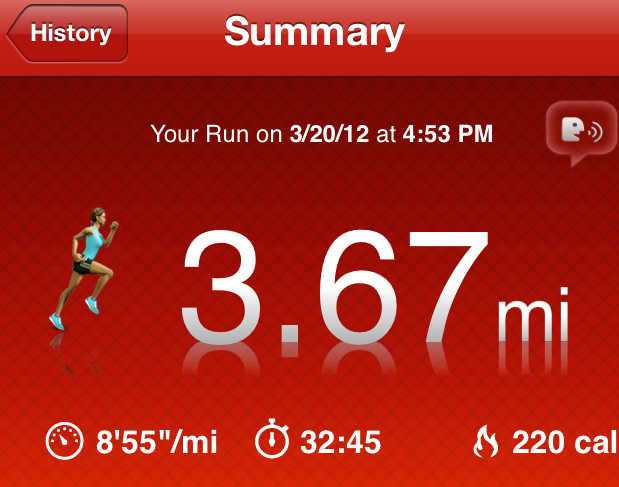 Easy pace for my run. Can you tell that I got rained on? 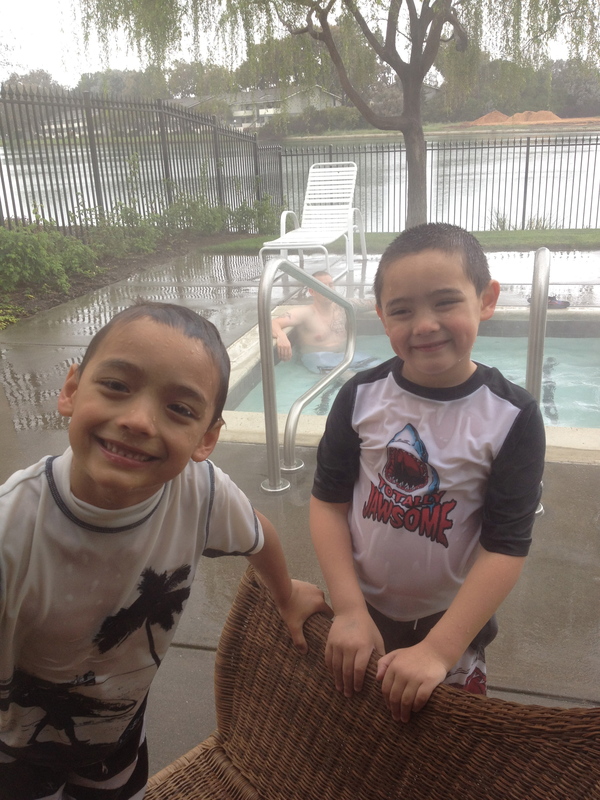 Ben and the boys at the spa while it rained. Tone It Up’s Self Magazine Drop10 Toning Workout – used 5lb. weights and a 10lb.Kettlebell. I was going to use my usual 6lb. medicine ball but Gio convinced me to use the heavier kettle bell for a challenge. 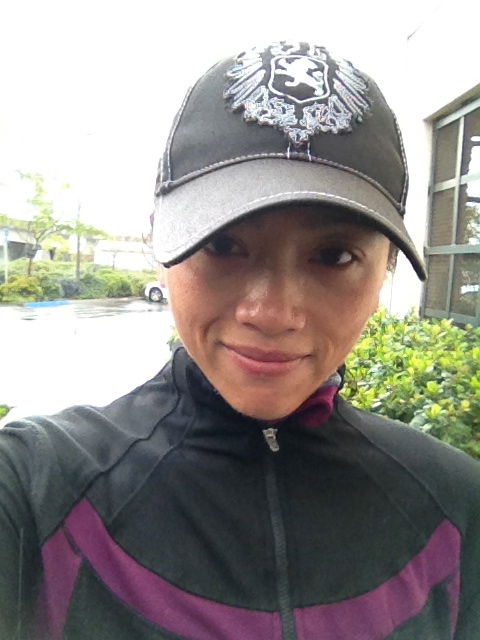 Turbo Fire Day 48 – Fire45 is more like a dance party to me than a workout. This has the Best music and is so much fun!! I’m always singing “Boom I Got Your Boyfriend” for the rest of the day :-) I really wish I could get the soundtrack to these workouts to have on my iPhone. I’d probably bust out doing the moves when I hear it. 2 min plank – 30 second on hands, 30 second each side, 30 seconds on hands. I really didn’t feel like doing it but I made myself. Doing these PlankADays has really helped my core and if I skip more than one day, I’ll keep on skipping. Gotta stay on top of it. M1 – Mini Luna bar. Needed to put something in my stomach since I slept in. 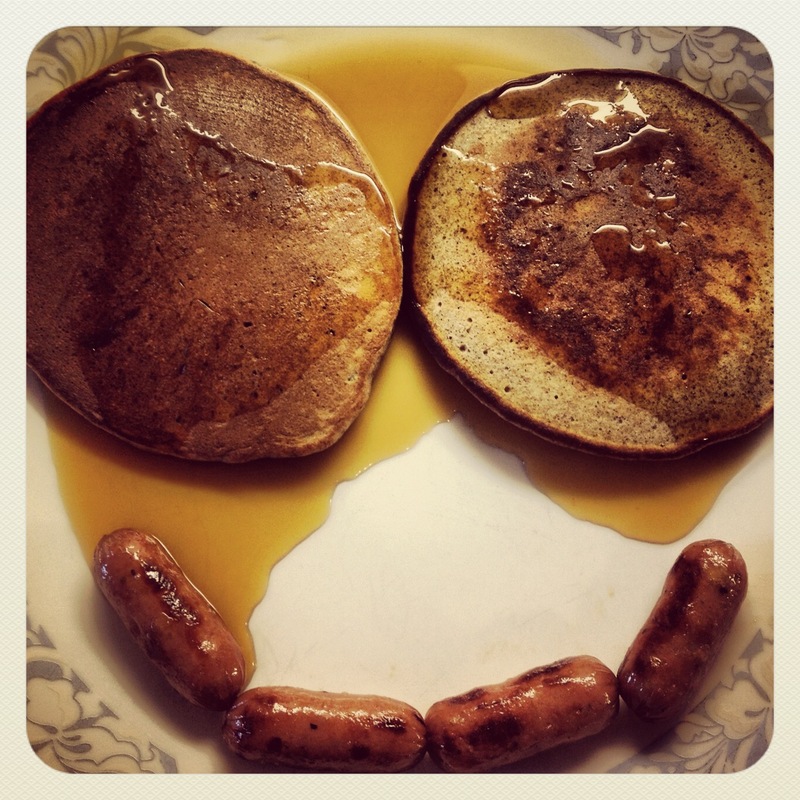 M2 – 2 Buckwheat Banana Pancakes with Maple Syrup and 4 Apple Chicken Sausages. 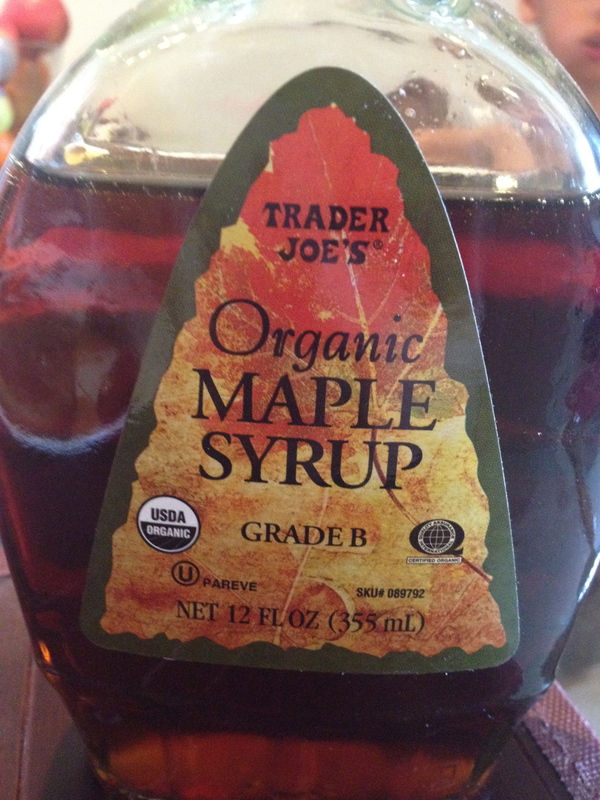 When I'm craving syrup for my pancakes I turn to TJ's Organic Maple Syrup. 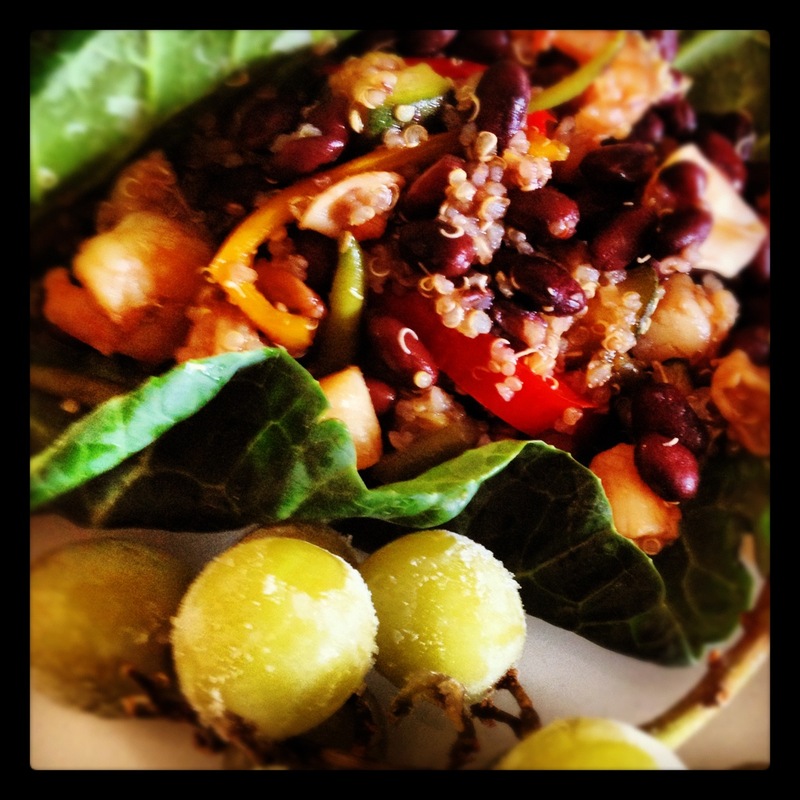 M3 – Left over Trader Joe’s Turkey Chili with Beans on top of Brown Rice with spinach added in. 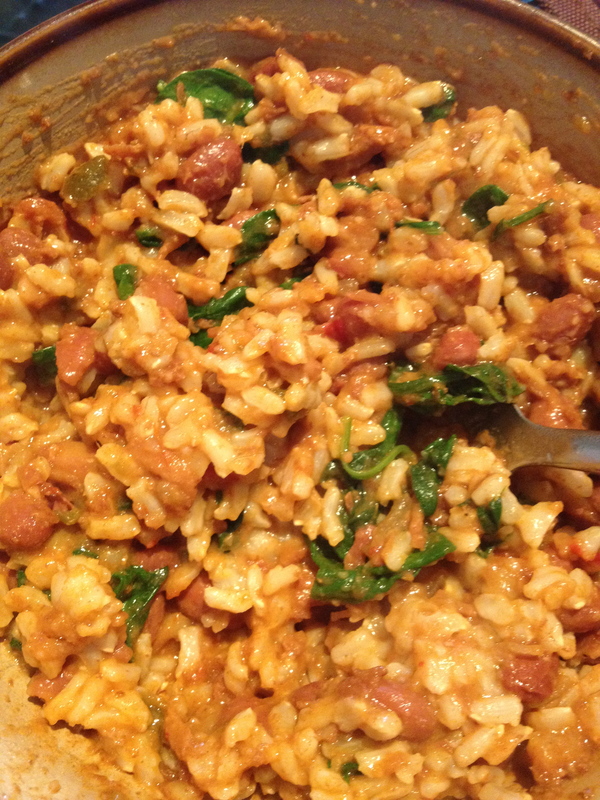 Warmed up the Brown rice and Chili, added spinach and mixed. The heat softened the spinach up. M4 – Peanut and Dark Chocolate Kind Bar. 60 o.z of water and 1 Zico. What a Long day! I could have really used a nap today. Today was Gio’s last day before his 3 week Spring Break :-/ I will have to change up my routine a little bit and hopefully I will get a week break with them at Grandmas – fingers crossed. lol. Day Started at 6a – Bootycall: Day 23 of Mad Abs March – 36 pushups, 44sec side plank, and 46 crunches + MiyaTv Beach Workout with Tone It Up – 20 reps eachX3 sets. Used 6lb. medicine ball during lunges and 5lb. weights for dead lifts. Self Magazine & Tone It Up Drop10 Diet Inch Eraser HIIT workout. 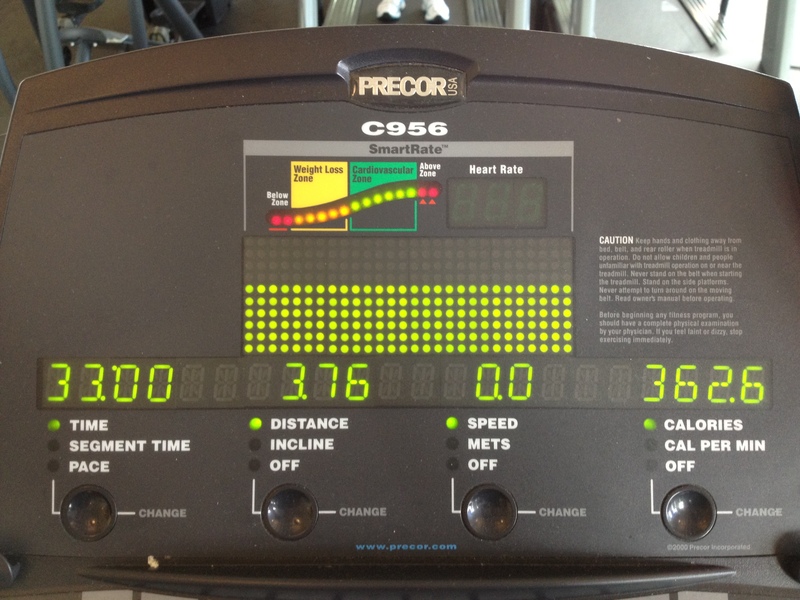 Incline set at 3 during the workout and at 5 during the cool down. 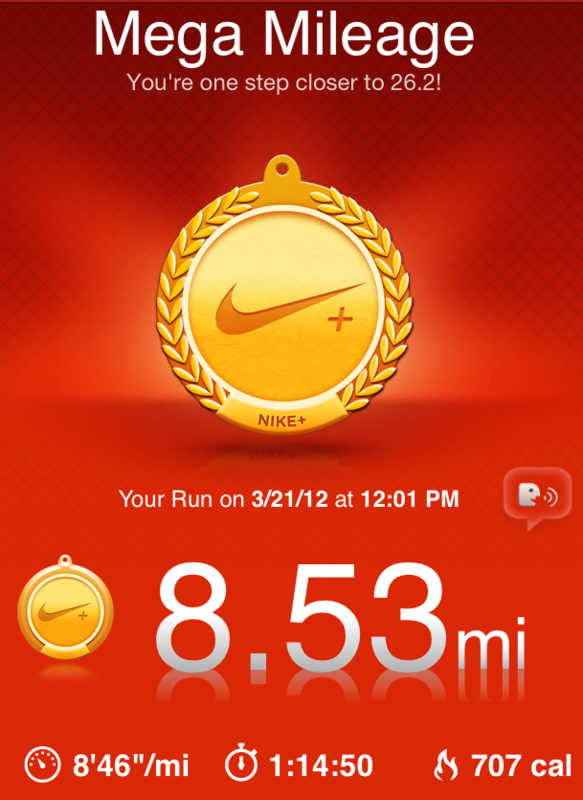 Jogging pace was 6.5mph and Sprint pace was 8-8.2 mph. The last few 90 sec sprints were tough. 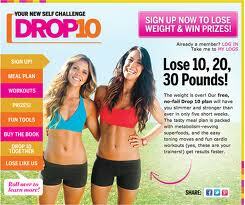 Tone It Up and Self Magazine's Drop10 Challenge :-) Join Now! 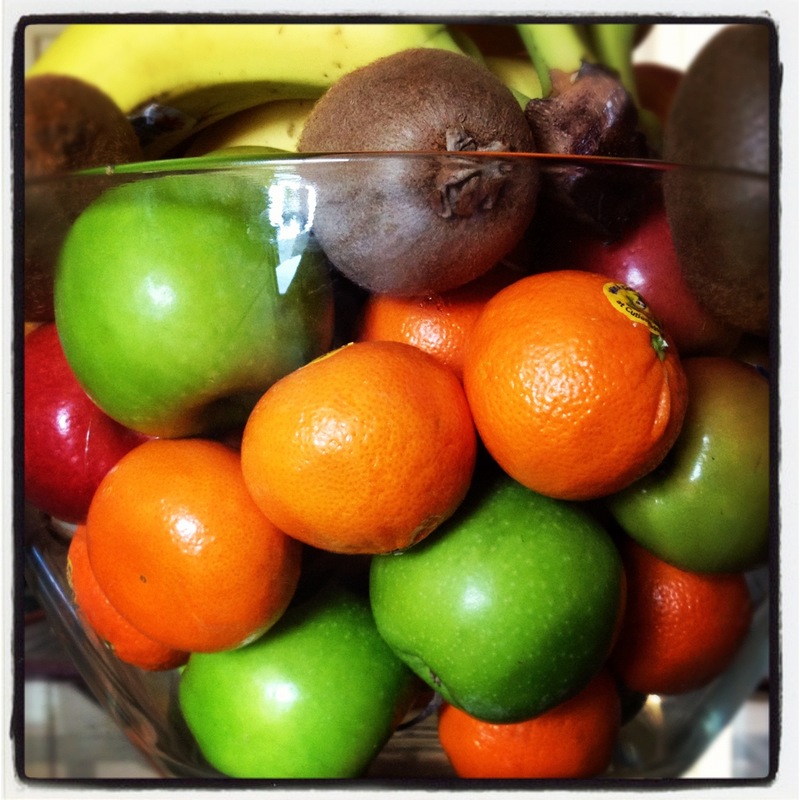 Tone It Up’s Friday Happy Hour Challenge – 40 of your Favorite Exercise Every Hour! – I chose to do tummy tucks :-) Started at 9a ended at 10p. Missed a couple hours but made them up by adding an extra set the following couple hours. Turbo Fire Day 47 – Did this a lot later than I usually do. Fire55EZ is a long workout but I went all out today. I had an audience with Ben and the boys watching me the whole time :-/ Lol. I felt like I jumped really high during the tuck jumps today! I could feel my feet actually leave the ground :-) Tuck jumps are super hard for me so I’m really happy that I’m improving. That pretty much wiped me out. Ending with a 2 min plank. 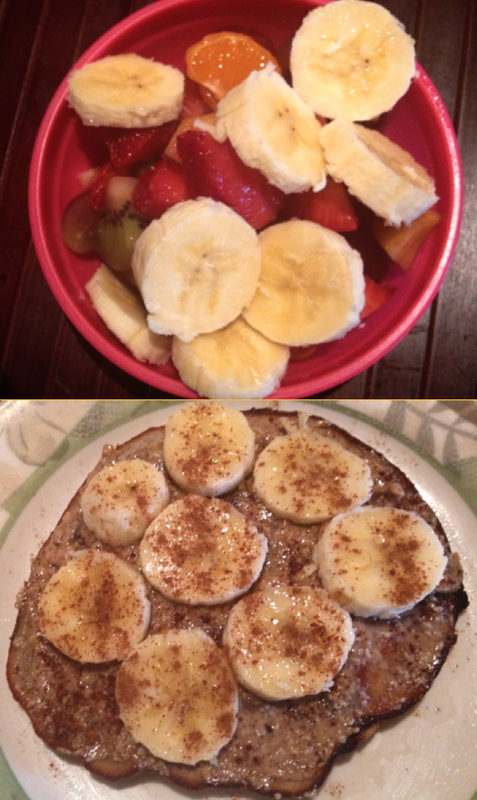 M1: Leftover protein pancake with almond butter, banana, and cinnamon with a side of fruit salad. Last protein pancake and fruit bowl. M2: 1/4 c. of Dark Choc Almonds – on the go. M4: Post workout shake – Chocolate Shakeology with almond butter and frozen blueberries. Seppe decided to drink a good portion of it too. lol. He loves Chocolate Shakeology. ~ While at Seppe’s practice, I got a little hungry. I reached in my bag for a power bar but got an almond Snickers bar. It’s been in there for about a month. lol. I decided to eat it :-) I haven’t had a candy bar in a Long time and I needed some “happy” food. M5: Didn’t have anything prepped for dinner and I was super tired. Ben wanted Panda and got some for him and the boys. 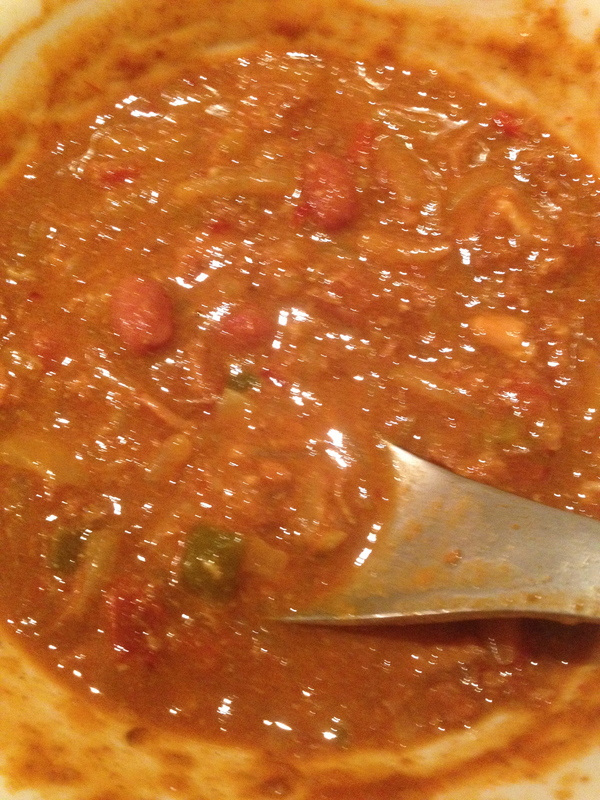 I went for some Trader Joe’s Turkey Chili with Beans. The can is 2 servings so I just had half so I only had 1 serving :-) It was actually very filling and yummy. 80 oz. water and 1 Zico. Despite a rough emotional night, I got up at 6a and did Tone It Up’s Self Magazine Drop10 Toning workout and Mad Abs March Day22. The 35 pushups were extremely hard. I think it’s because I did Day21 last night instead of yesterday in the morning. My arms were still fired from the 34 pushups. Turbo Fire Day 46 – I think I’m doing better with the bicep curls in Tone30. I think I’d do better with weights than the band especially since it’s only 1 set of 12 followed with a set of 8. I think the band is working though. I guess I just want to see faster results. lol. I think I’ve got Fire30 down! Had so much fun today. I always have fun with the Fire workouts. It’s dancing and kickboxing mixed together with HIIT to great music. I really wish I had someone to do it with. Ben wanted to brush up on his basketball skills before playing with his coworkers tonight, so we went to the park and played a couple games of 21. Let’s just say that I have a slight Disadvantage with Ben being a whole foot taller than me :-/ Lol. He was nice enough not to just stand by the net and score off my many missed free throws. I did score some points by taking advantage of his missed shots thought :-) It was a lot of fun. We went back to the park with the boys but I did an NTC workout (Fighter Fit) while he played with Gio. I chose one that didn’t require any equipment and it was really nice to workout outdoors. I didn’t want to do my Plank for today. I had already done one during the MadAbs workout and during the NTC workout. But I made myself do a 5 min plank to end my night. For the last minute I did hip dips and tried a move Chalene Johnson posted. “Start on your elbow in plank. Slowly rotate and drop your left hip allow the right foot to lift and hips to stack. Alternate slowly dropping, rotating to tap each hip." M1: Mutligrain Raisin Oatmeal w/ cocoa almond butter, blueberries, and chia seeds. 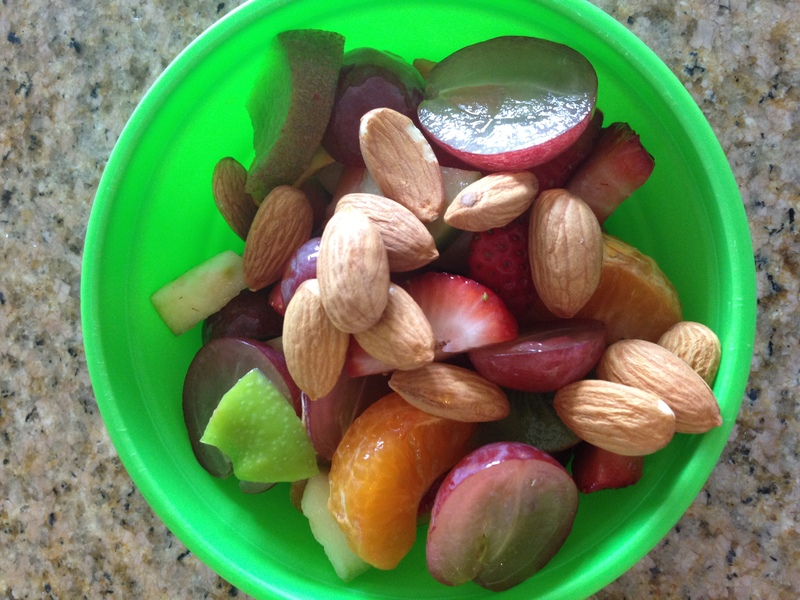 M2: Fruit Salad w/ handful of almonds. Added a handful of almonds for some protein. M3: Salmon, brown rice, spinach, tomatoes, and mushrooms. Salmon Rice bowl topped with avocado. 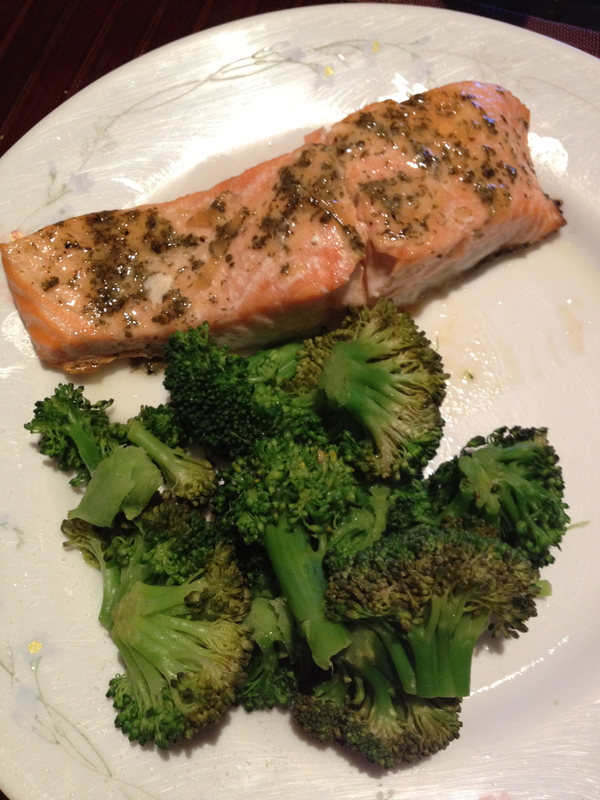 M5: Salmon, broccoli, and asparagus. I’m really tired right now so I’m going to make this shorter than my usual. 66 Degrees and Sunshine w/ a few clouds = Shorts! 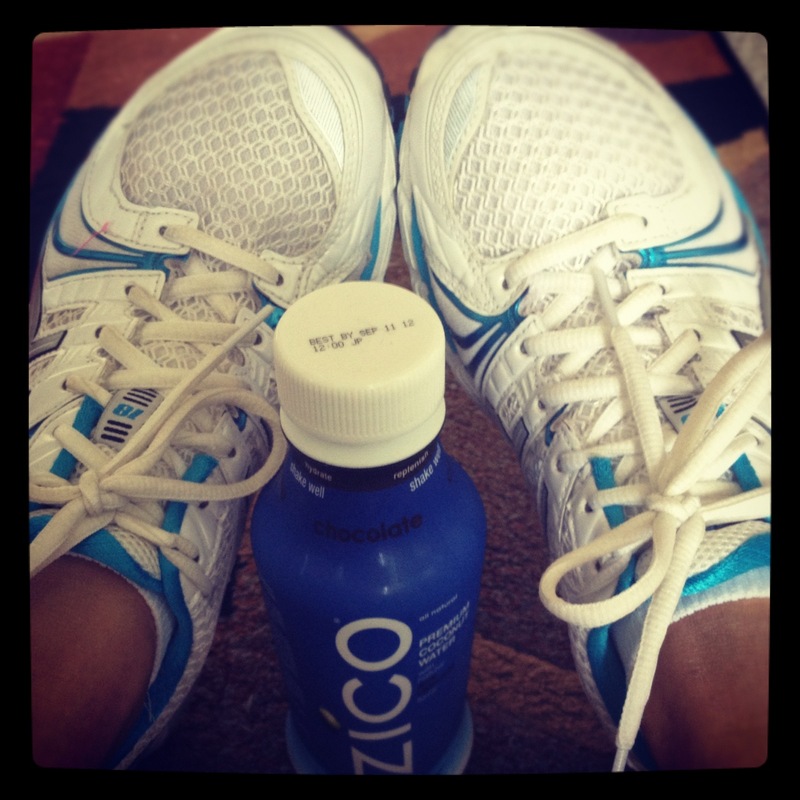 My Favorites: My Asics Running Shoes and Chocolate Zico. 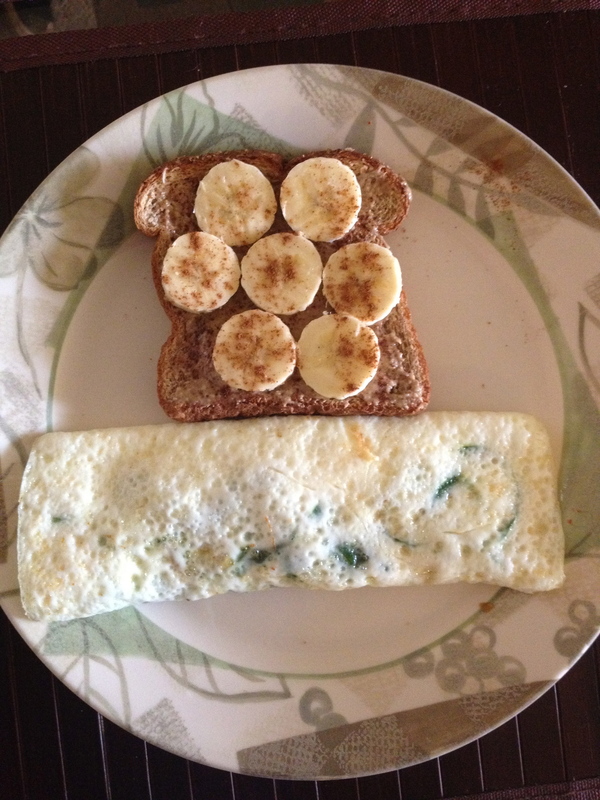 M1: Egg white, tomato and spinach omelet. 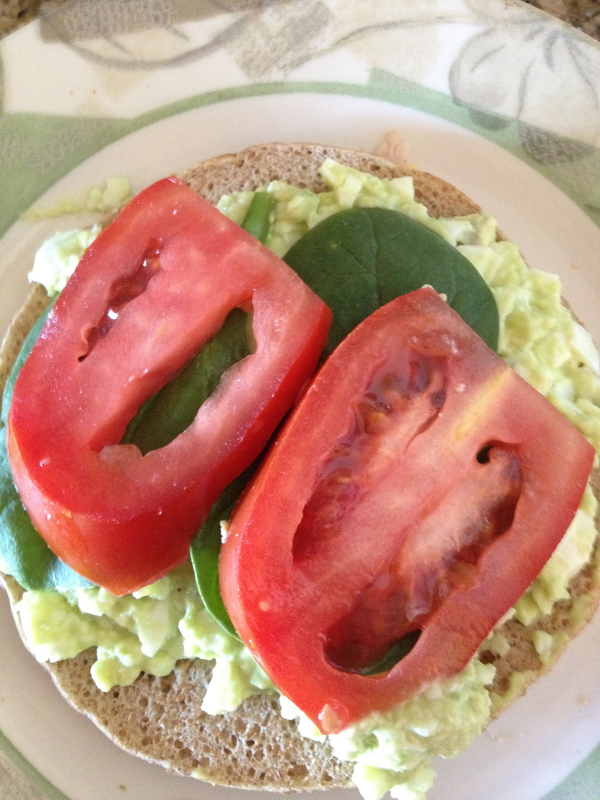 So thrilled that it came out perfect :-) Also had Whole Wheat Toast w/ almond butter, banana and sprinkled w/ cinnamon. Finally made a perfect omelet!! M3: Couldn’t decide what I wanted – just took a bunch of left overs and made a mix: brown rice, seafood quinoa and veggies, and black beans. 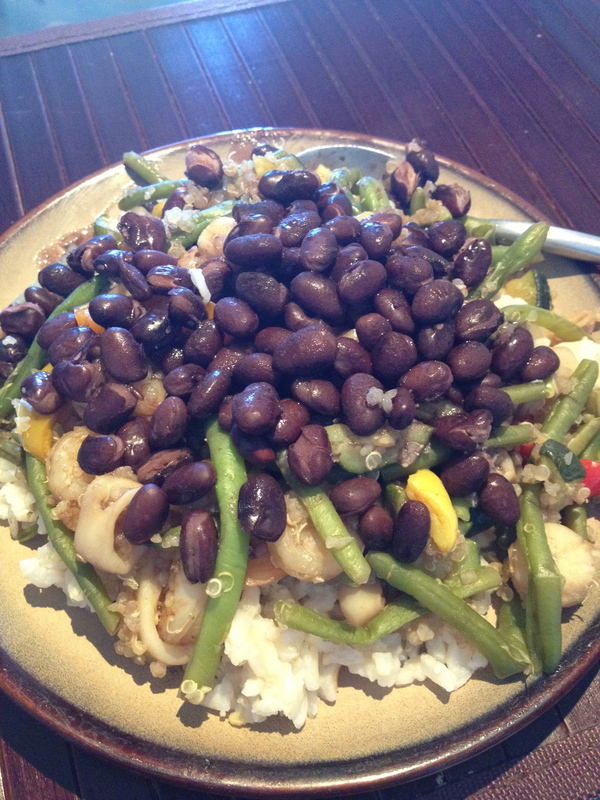 Leftovers: brown rice, Seafood/quinoa/veggie mix, and black beans. 60 oz. of water. Zico during my run and Chocolate Zico after my run. I forced myself out of bed at 6a today. I think my main problem is that I stay up way too late. Lol. Gotta make an effort to get to bed earlier so I have the energy to do my workouts and deal with Life. Started with Day20 of MadAbs March. 32 Pushups!! It’s slow going once I hit 20, but I manage to do it all on my feet :-) Did Tone It UP’s SelfMagazine Drop10 Toning workout – used 6lb. medicine ball again for Side Slimmer and Kick Outs. The Total Transformer Move was really hard on my knees this morning so after the first set, I modified it by bending my knees and doing one leg at a time. After dropping the boys off at school and doing some grocery shopping, it was time for Turbo Fire. Turbo Fire Day44 – Started with Sculpt30. I really focus on making the bands tighter for the bicep curls. I want to have some guns :-) Lol. Mini ones at least. Did some more pushups on my feet for this workout. After doing 32, a set of 4 and a set of 8 wasn’t too bad. The tricep exercises were tough today because my arms were sore from doing the Drop10 workout. I went all out for Fire30. Did all the jumps and turns. I Punched and Kicked hard. Having so much fun now that I know all the moves. Before dinner I hit the gym to do Tone It Up’s Max Burn Pyramid X2. 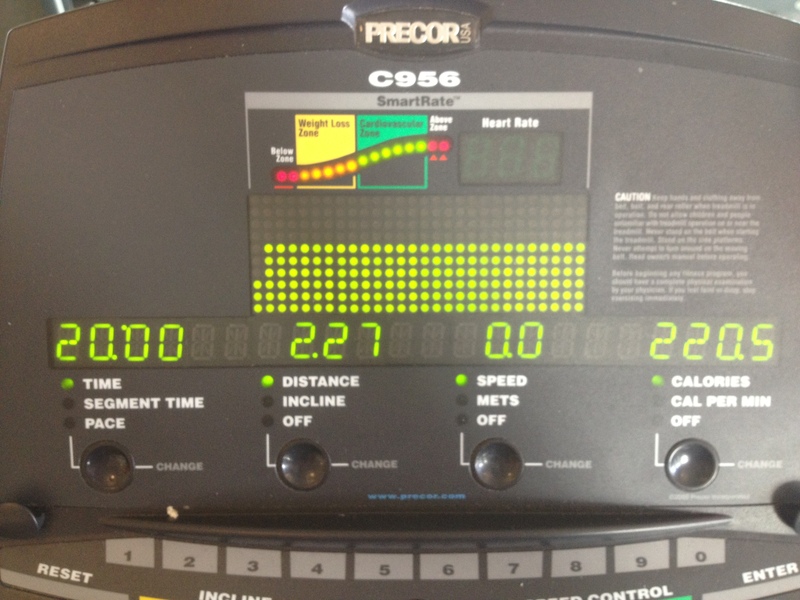 For the 5 minute runs, I did it an incline of 5 – to get some hill training in. I was drenched with sweat at the end. I’ve been wanting to do this workout since it was posted. I love it. Counting the Side Planks from this mornings’ Mad Abs Day20 and the two planks for the MaxBurn Pyramid as part of my plankaday. I’m just way too tired to do a separate on tonight. I’ll make sure to do a long one tomorrow. 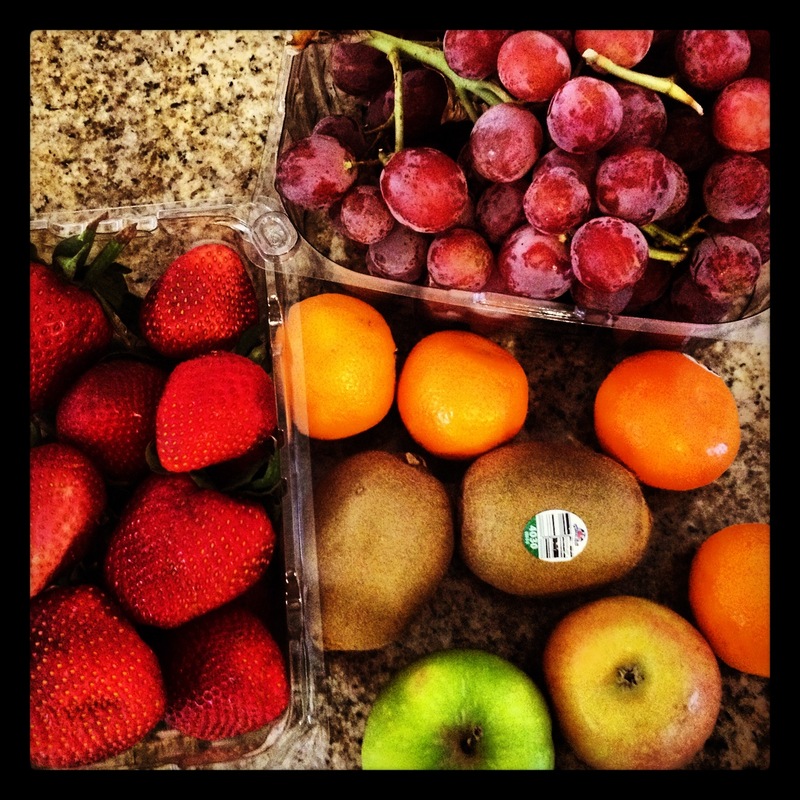 Meals – Fuel up day for my long run tomorrow so a little more carbs. M1: Chobani Champions Chocolate Chunk w/ almond butter and chia seeds. 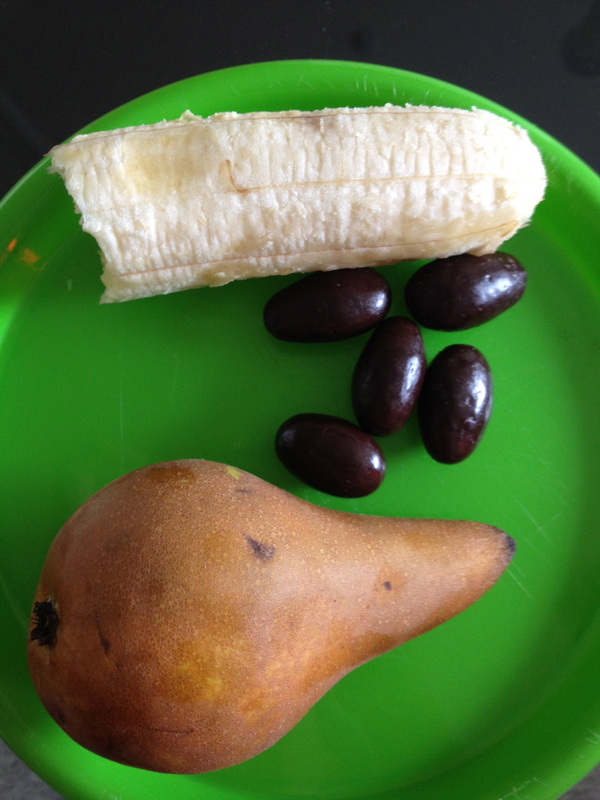 M2: Half a banana that Gio didn’t want to eat for breakfast, a small pear and 6 dark chocolate almonds. M5: Whole Wheat past with ground turkey and spinach red sauce. Whole Wheat pasta to carb up for tomorrow's long run. 80 oz. of water and a Zico. I missed my bootycall workout this morning though. I turned my alarm off and fell back asleep – before I knew it, it was an hour later O_o Lol. It was a rush to get the kids to school. After Seppe’s speech therapy, I decided to get my TurboFire workout done. 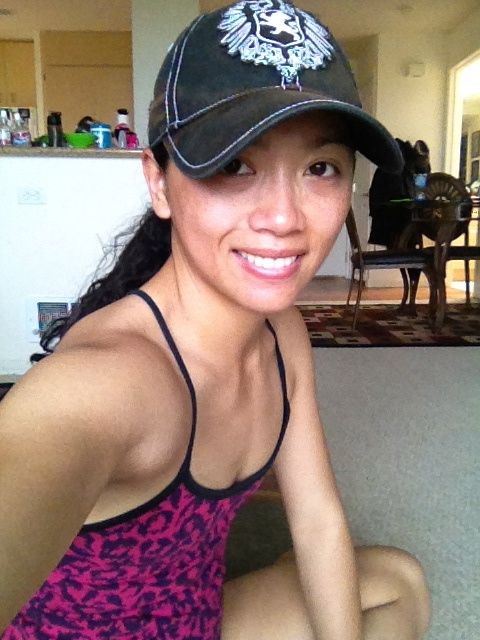 I did Day19 of Mad Abs March first – 37 sec side plank, 38 crunches, and 31 pushups. Oh man the pushups were hard today, but I am determined to do them all on my feet. Turbo Fire Day 43 – I really focused on my intensity with Fire55EZ today. I punched hard and kicked as high as I could. I jumped with the high low punches and did all the tuck jumps :-) The hour just flew by and I was a little sad when it was over. I seriously have so much fun with these workouts. Drop10 HIIT workout - 15min w/ 5min cool down at incline 5. 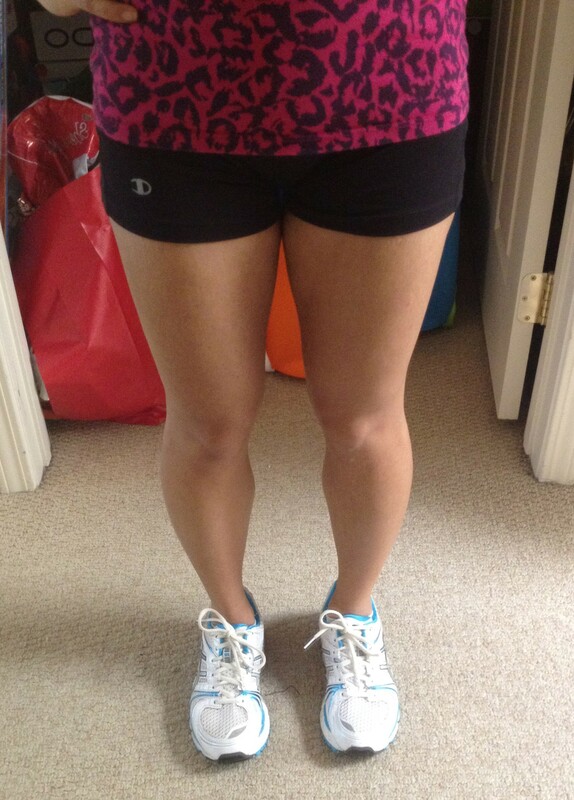 To makeup for missing my bootycall workout, I did two NTC workouts – Ab Burner and Shawn Johnson’s Stretch Guide. The stretching felt great. I’m no where near as flexible as Shawn Johnson but the moves really stretched me out. Ended with a 2 min a plank on my hands. 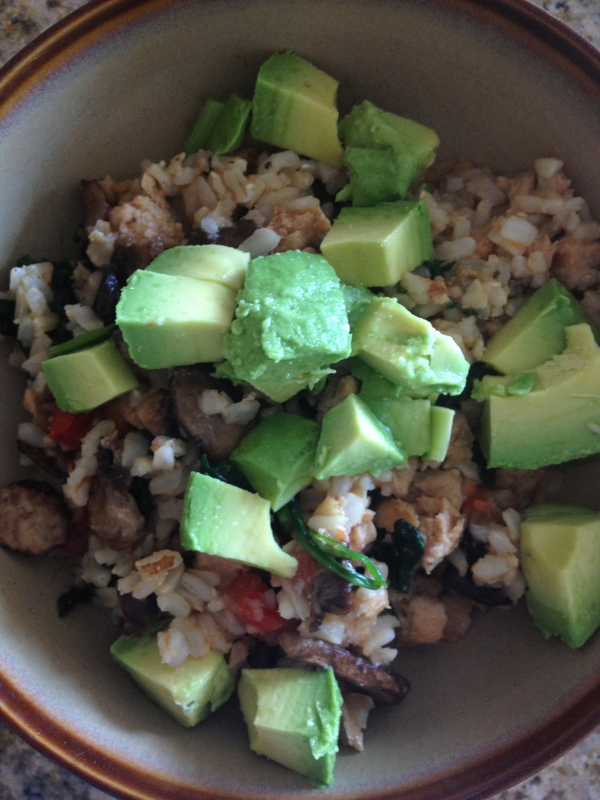 Meals – I didn’t have everything I needed to follow the meal plan for the Drop 10 but I will definitely be picking up ingredients for the recipes that I want to try. 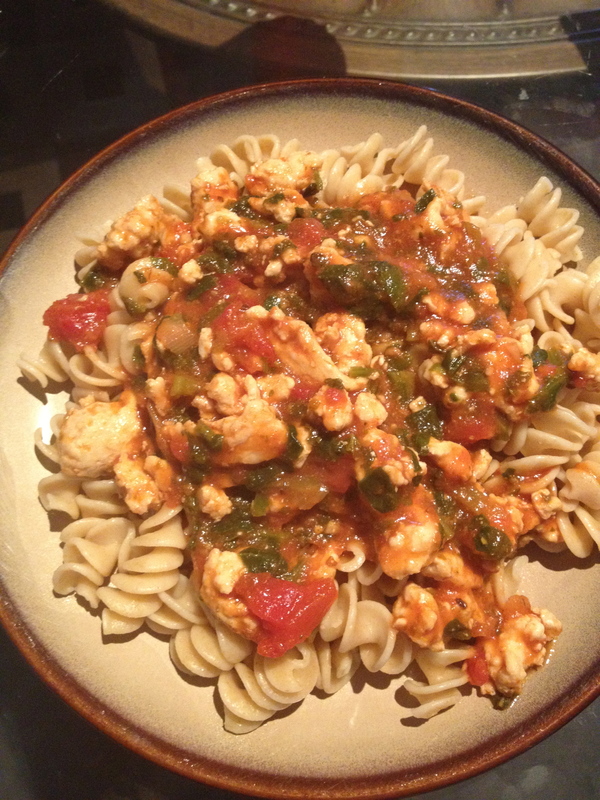 And there are quite a few recipes on the meal plan that I want to try out :-) I am really enjoying my Meatless Mondays. It’s really not that hard to find other sources of protein. 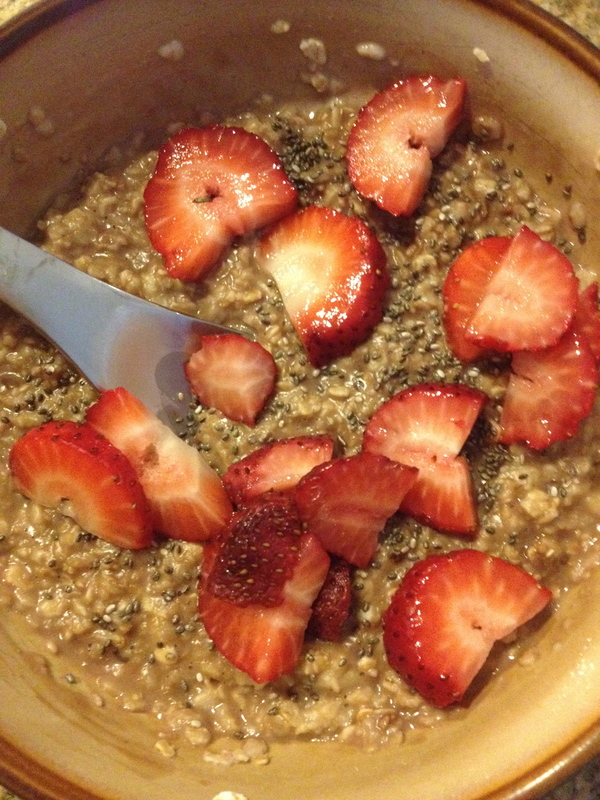 M1: FlaxPlus Oatmeal with 1/2 tbsp of cocoa almond butter, chia seeds and strawberries. Just a little bit of cocoa almond butter goes a long way. 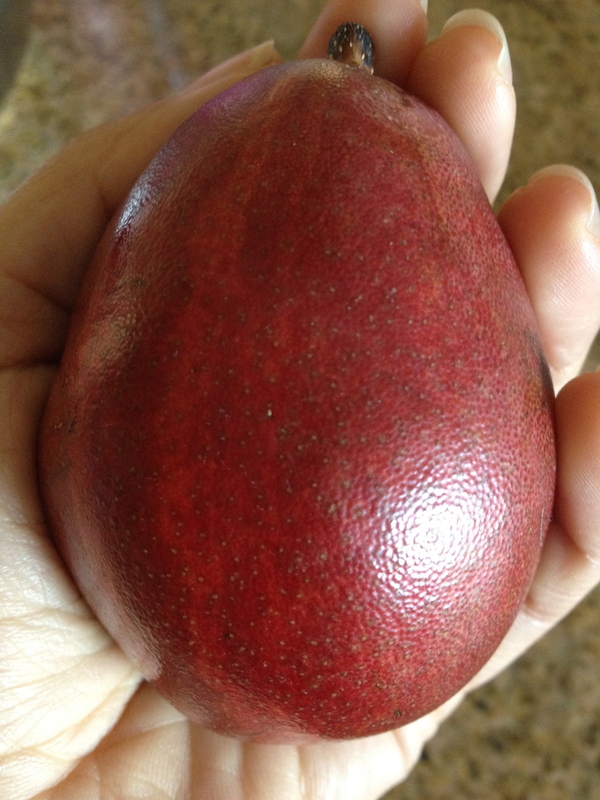 M2: Red Pear – this was really sweet and juicy. Mini Red Pear was sweet and juicy. 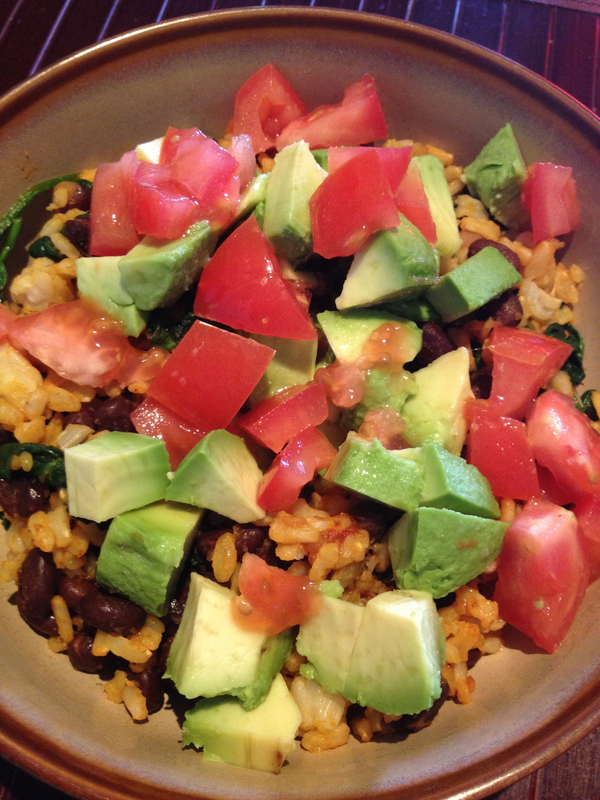 M3: Black beans, brown rice and spinach sautéed together and topped with avocado and tomato. 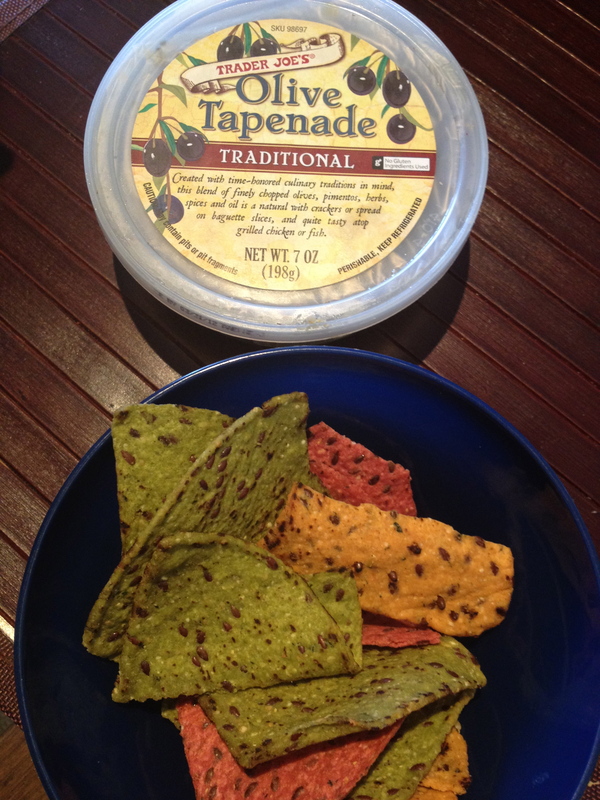 I love these Veggie Flaxseed Tortilla Chips from TraderJoes. 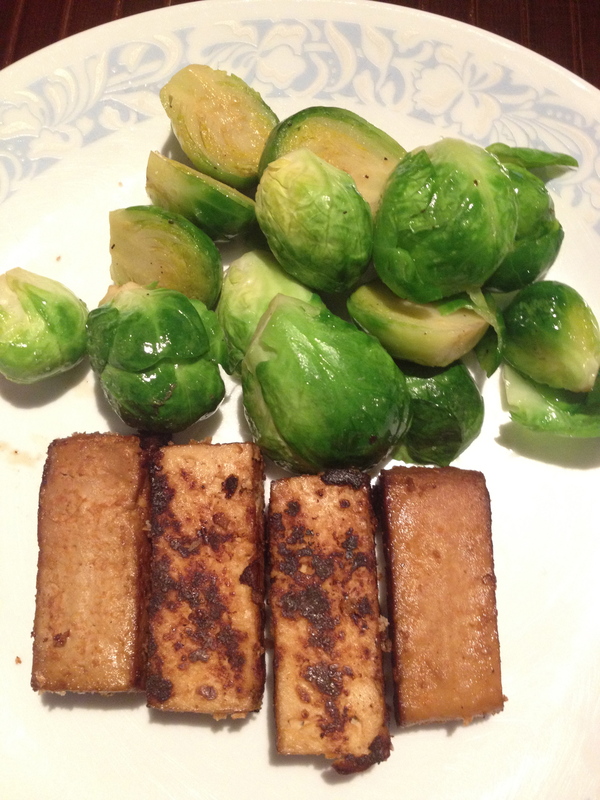 M5: Teriyaki Tofu browned and served with brussel sprouts.